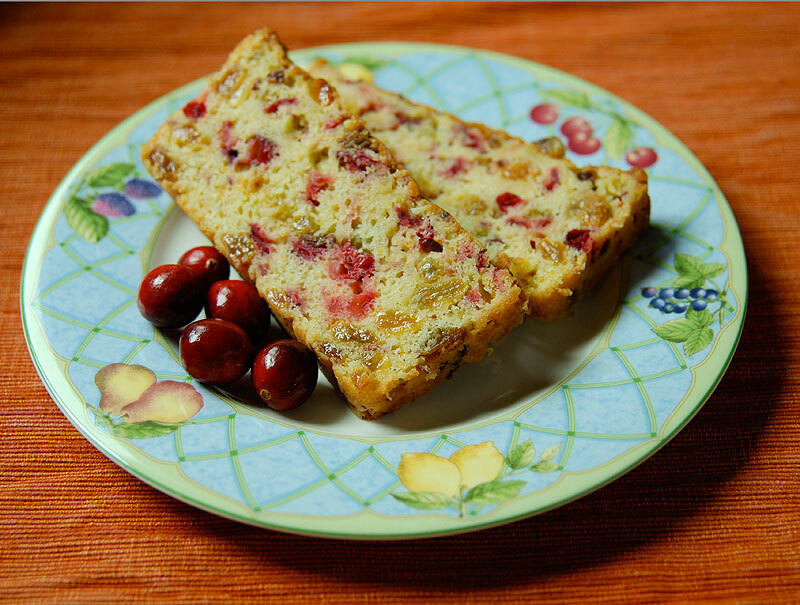 I was telling a coworker about my candymaking and baking a couple weeks ago and she mentioned that she had a great recipe for cranberry bread that was a Thanksgiving staple in her family for many years. 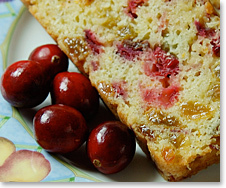 My grandmother makes truly wonderful apricot bread during the holidays (Yes, I’m getting the recipe), so I was really interested in this cranberry bread. She emailed it to me and off I went to get some fresh cranberries. When it came time to make the recipe, I noticed an unusual amount of orange juice in the recipe (it was called twice), so I went online to look for the recipe, since she said it was from an old cookbook entitled, Cranberry Thanksgiving, by Wende and Harry Devlin. This book appears to be out of print, but you can still find it online at a premium. A quick search on the web quickly revealed that this is a popular recipe, and I quickly found the error in the recipe and proceeded to make it with confidence. I was pleased to be able to use my standard-sized food processor, which otherwise gets used maybe once every couple years. The recipe is super easy to make, and I was pleased I could reuse the unwashed food processor bowl for chopping the cranberries. The smell of this bread baking is wonderful and perfect for the holidays. The finished bread is delicious with a slightly dense texture—like banana bread—and nearly as moist. If you really love cranberries you can omit the golden raisins and double the cranberries, but I decided to play it safe my first time around with this recipe. 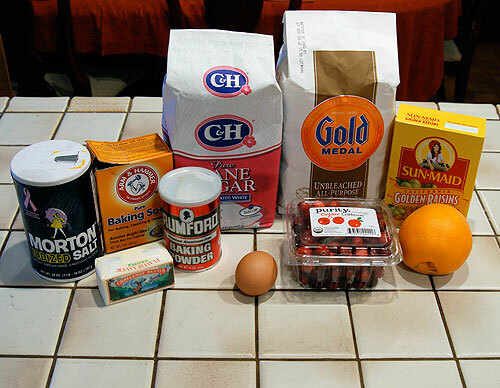 Ingredients for making Cranberry Bread. 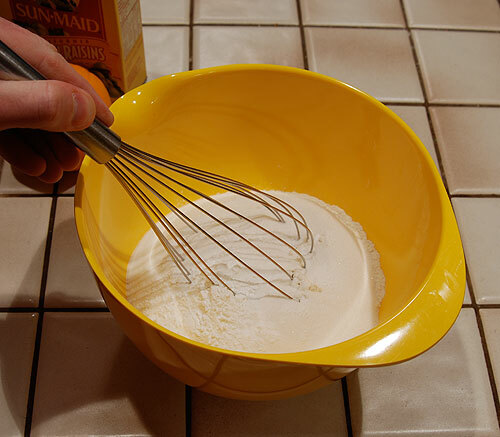 Combine 2 cups of flour, 1 cup of sugar, 1 teaspoon of salt, 1/2 teaspoon of baking soda and 1 1/2 teaspoons of baking powder and mix until blended. 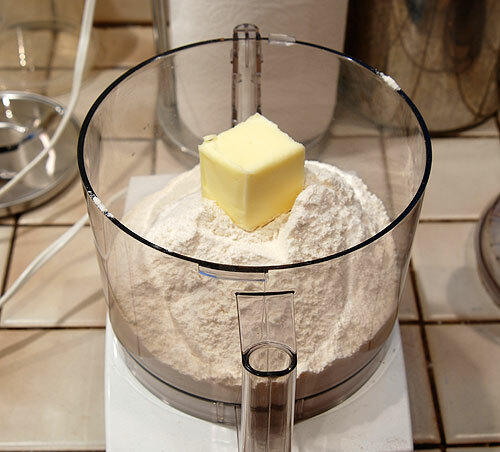 Add 1/4 cup of chilled butter to flour mixture and pulse in food processor until butter bits are pea sized. 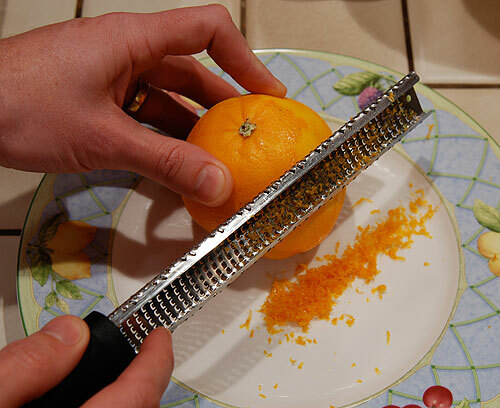 Use a microplane zester to remove 1 teaspoon of zest from an orange. 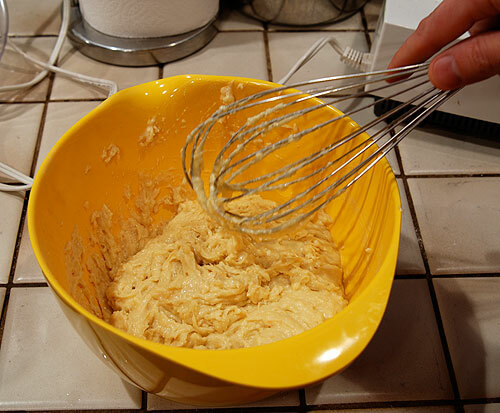 Add the zest, 1 beaten egg and 3/4 cup of orange juice to flour mixture, folding in liquid until evenly moist. 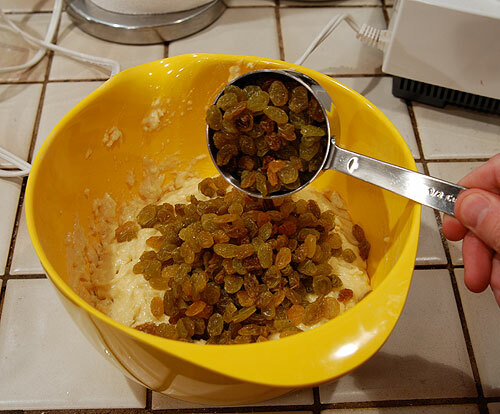 Add 1 1/2 cups of golden raisins. Add 1 1/2 cups of chopped, fresh cranberries. 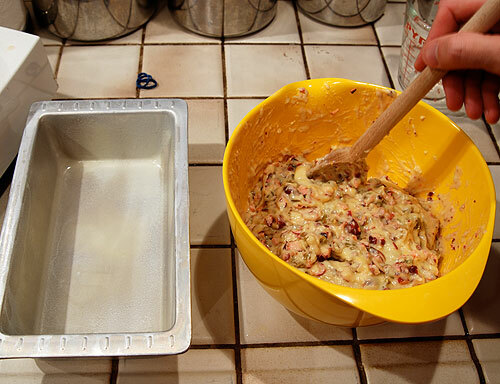 Spoon mixture into greased bread pan. 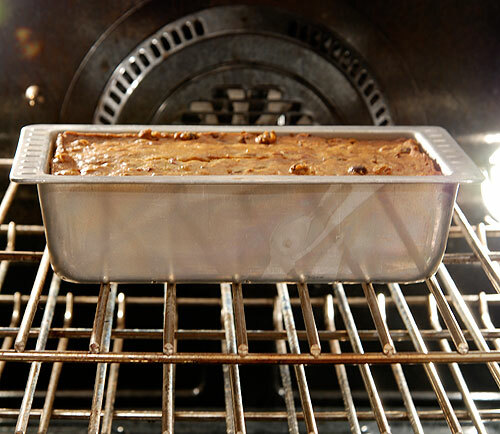 Bake in 350° F oven for 1 hour and 10 minutes. Let cool a couple minutes before transferring to wire rack to cool. 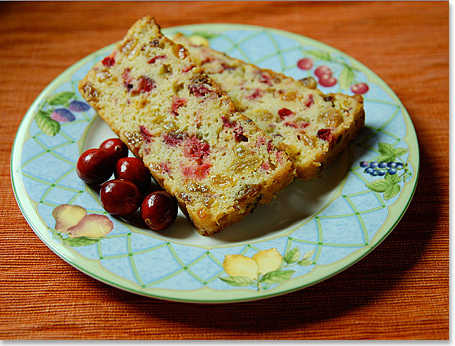 The recipe pictured above, with detailed instructions and photo gallery can be found on the Cranberry Bread recipe page. This entry was posted on Tuesday, December 2nd, 2008 at 11:00 pm	and is filed under Cupcakes & Muffins. You can follow any responses to this entry through the RSS 2.0 feed. You can leave a response, or trackback from your own site. Lynn: I rarely used my food processor but this recipe and my apricot bread recipe are keeping it from gathering dust. I like that you include pictures in everything. I need visual aid. Haha. This looks really great. I don’t have a food processor, is there a way to do this without it? 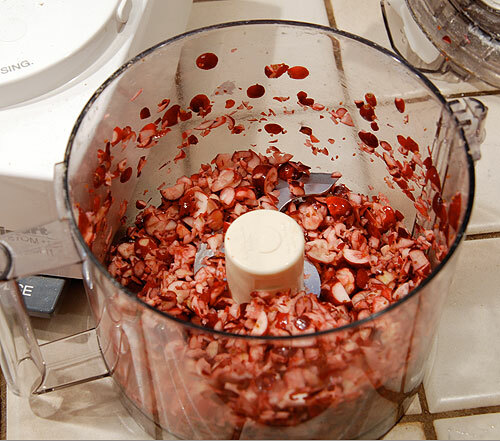 You can get by without a food processor, it’s just a little more work chopping things by hand. Wow! Can’t believe a bread that looks this good seems this easy to make. Can’t wait to try it. Love the colors cranberries and golden raisins bring! Thanks for sharing.